Inventory, Inventory or should we say Lack of Inventory is the buzz word in Real Estate these days. This is no exception in both Foothill Ranch and Portola Hills. The market ended with very few homes on the market. 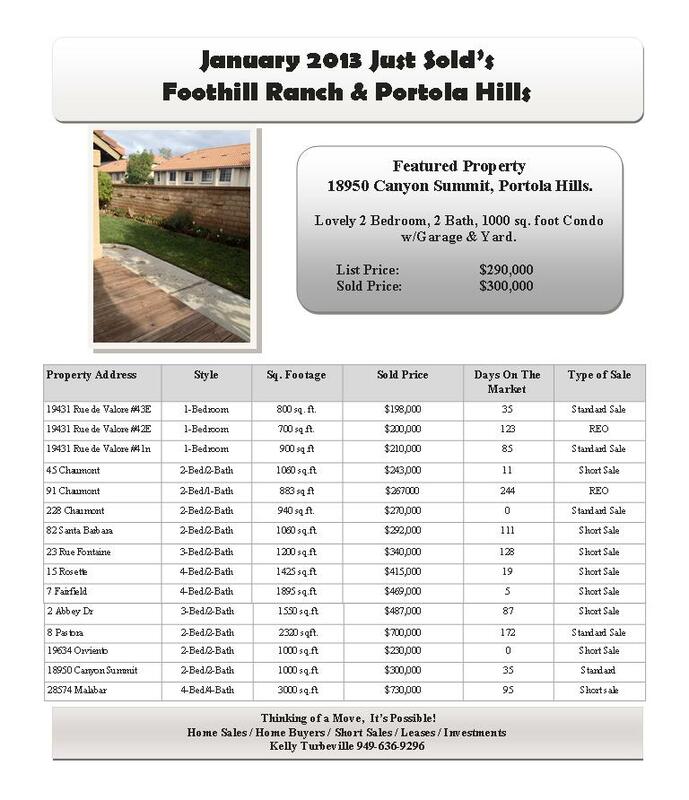 Good news... though for home sellers these homes successfully closed escrow in the first month of 2013! Have you been thinking about a move.... you will want to seriously take into consideration the low inventory.. as this is going to offer a the opportunity to receive top dollar for your home. In addition, with interest rates projected to tick up, you have actually reached the perfect storm in Real Estate. Top Market Price, Huge Buyer Demand, resulting in Multiple Offers and allowing you to purchase a move up property at today's low interest rates. Wondering what your home is worth....simply send us a note and we will send you over a FREE Market Report or your property and the immediate neighborhood! It's that simple!